For more information about Joomla, visit the Joomla Web site. Define extension\_dir as c:\php\ext (for example, the location of your php extensions directory). Uncomment extension=php\_mysql.dll in the extensions list to enable MySQL support. 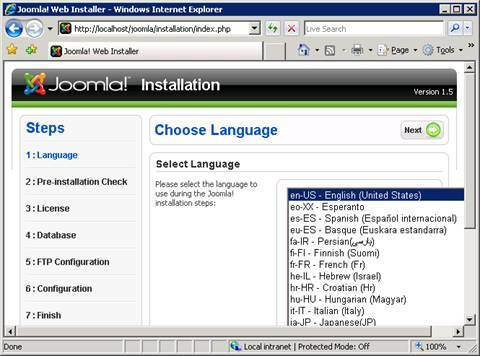 In order for Joomla to work correctly with IIS 7 and above, it is necessary to install an Update for IIS FastCGI module for IIS 7. First, download the latest stable release of Joomla. 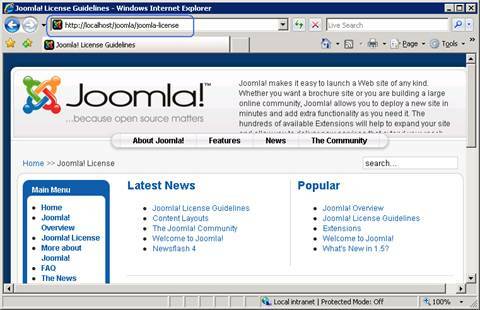 For this article, Joomla version 1.5.14 was used (future versions are likely to be similar to install). Uncompress the Joomla files and copy them to C:\Inetpub\wwwroot\joomla (or another directory of your choosing). 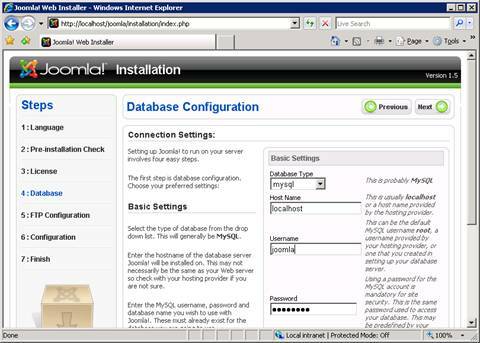 The installer will modify the Configuration.php file with information provided during the installation process. Select the language, and then click Next. 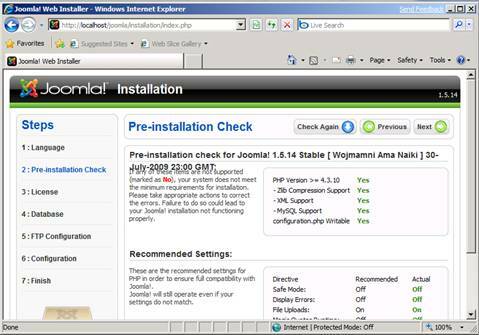 Verify that all pre-installation checks are successful, and then click Next. 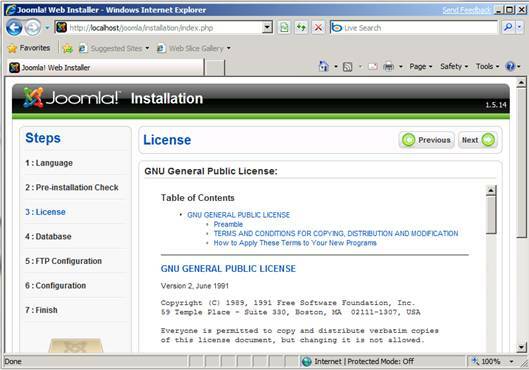 Review the GNU General Public License, and then click Next. On this page enter the following information, and then click Next. 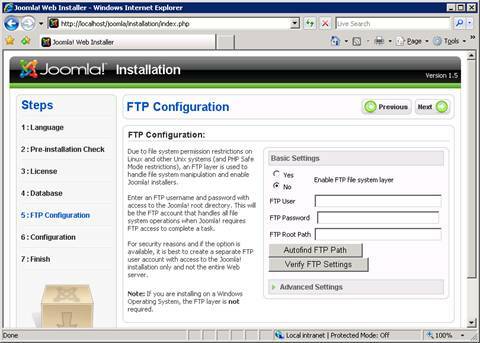 On the FTP Configuration page, select the No option button (not to enable FTP file system layer), and then click Next. Specify the site name and the administrator password. Click Next to complete the installation. Note: You may scroll down and install sample data if you prefer. 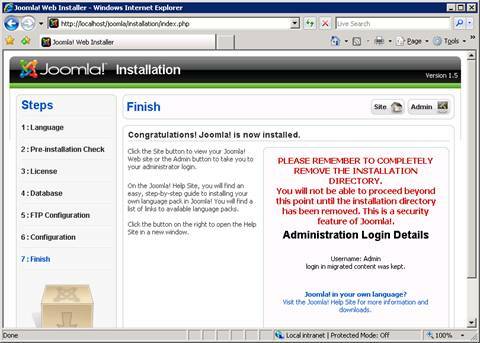 The Finish page appears, and you are instructed to delete the C:\inetpub\wwwroot\joomla\installation directory. You can now go to the Joomla site. By default, Joomla uses query string parameters for all the URLs it generates for your Web site. You change this by enabling search engine friendly URLs, a feature which relies on the URL rewriting functionality. IIS 6.0 does not include URL rewriting capabilities; you can use a third-party URL rewriting product such as ISAPI_Rewrite or Ionics ISAPI Rewrite Filter. IIS 7 and above includes URL rewriting support, which can be enabled by installing Microsoft URL Rewrite Module for IIS 7. Download and install the Microsoft URL Rewrite Module. 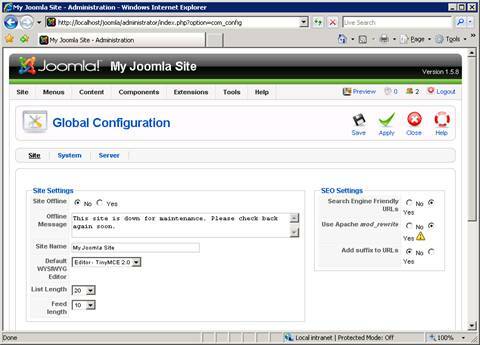 If it does not already exist; create and open a Web.config file located in the C:\inetpub\wwwroot\joomla directory. Paste the following XML code into this file. 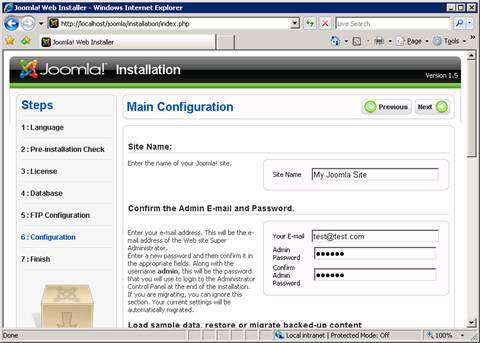 Open a Web browser, and log on to the Joomla administrator console at http://localhost/joomla/administrator/. 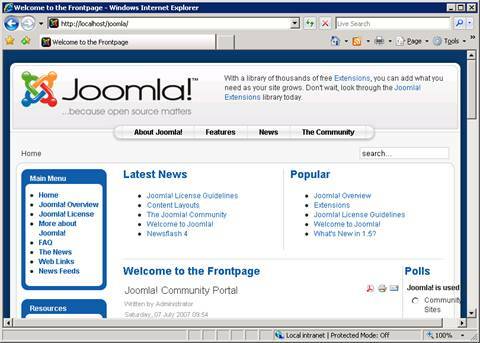 This article updates " Joomla! on IIS" by Ruslan Yakushev, published on December 12, 2008. Setting up FastCGI for PHP. Using FastCGI to Host PHP Applications on IIS 7.0 and Above. Installing PHP on Windows Vista with FastCGI. Installing FastCGI Support On Server Core.